In the Primary and Elementary Modules (grades K-5), the research-validated Reading Mastery Program developed by Engelmann and his associates is implemented to teach students the skills necessary to become fluent, independent, and highly skilled readers. In the beginning levels of the program, students are explicitly taught phonics skills, including strategies for sounding out and blending new words. In addition, they acquire a large sight word vocabulary. Daily fluency building exercises allow students to develop a level of automaticity that makes reading effortless and fun. Students at all levels are specifically taught important comprehension skills that allow them to answer both literal and increasingly difficult inferential questions with ease. These comprehension skills enable students to think critically in all areas of the curriculum. Beginning in the Elementary Module, the focus changes from “learning to read” to “reading to learn”. At this time, students apply their reading skills to content-area texts, which they read and understand effectively. In addition to the core reading program, students in Mt. Helix Academy’s Elementary and Jr. High Modules complete a number of novel studies. The main goal of this literature program is the development of sophisticated skills in comprehension and literary analysis. The program also fosters an understanding and appreciation of a variety of literary forms. 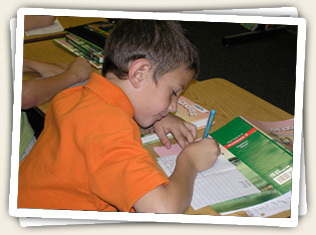 Through a sequence of exercises involving creating, critiquing, and discussing both print and non-print texts, our students also develop sophisticated writing skills that include the application of knowledge of language structure, language conventions (e.g., spelling and punctuation), media techniques, figurative language, and genre.